The potential to obtain access to the disc by placing a needle with x-ray guidance remained attractive. Alternative methods to remove disc material with better control than chymopapain were developed. Mechanical cutting and suction devices passed over the needle placed into the disc “ate” the inner core of the disc. This procedure became popularized as the percutaneous automated discectomy [PAD]. With continued technological advancement a laser fiber was passed through the needle and placed into the disc to vaporize the inner core of the disc. This procedure became popularized as the percutaneous laser discectomy [PLD]. These are blind procedures in that the removed disc material is not visualized. Also, these procedures were “indirect” discectomies in that they did NOT remove the disc herniation, but decreased the intradiscal pressure that would then decrease the pressure of the disc herniation, and hopefully, decrease the pressure on the nerve(s). For carefully selected patients, success is accepted as 75%. This procedure became very popular because of an “acceptable” success rate and the ability to perform the procedure without general anesthesia. This allowed the procedure to be done as an outpatient procedure. Despite the minimal invasiveness of these procedures allowing for even faster healing and recovery from surgery, the lumbar microdiscectomy caught up with better success and minimal additional hospital stay and recovery time. 25% or 1/4th of the patients that underwent percutaneous discectomy procedures went on to undergo a second open microdiscectomy surgery. Technological advancements have continued, especially with fiberoptics allowing direct light source and visualization through a small channel. 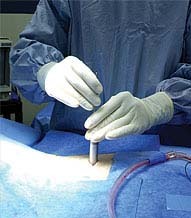 With slight modifications of the percutaneous techniques, a slightly larger cannula or channel can be directed over a needle into the disc space. Through this cannula or channel the disc can be directly visualized on a screen. With further refinements the channels could bend and be guided to the disc herniation, allowing not only removal of the inner core of the disc but also removal of the disc herniation. With even better optics, the nerves could be visualized after decompression to confirm relief of pressure. This modern procedure allows direct access to the disc without removal or disruption of normal tissue, visualization of the disc herniation and nerves, and removal of the disc herniation and verification of nerve decompression through a percutaneous technique. The procedure is performed with intravenous sedation without a breathing tube and the patient may walk as soon as able. The procedure presently is done as both an outpatient procedure and a 23 hour admission. One of the hopeful promises of this technique is minimization of scarring around the nerves, a common cause of failure in open discectomies. DESPITE THE EXCITEMENT IN THE POTENTIAL OF THIS NEW AND MODERN PROCEDURE, IT HAS NOT PASSED THE TEST OF TIME. THE EXPECTATION IS AT LEAST THE 75% SUCCESS RATE AS WITH BLINDED INDIRECT PROCEDURES, AND HOPE TO EQUAL THE 90% SUCCESS RATE OF THE OPEN MICRODISCECTOMY. THE COMPLICATION RATE IS UNKNOWN, AND IS POTENTIALLY HIGHER THAN FOR THE BLINDED PROCEDURE BECAUSE OF THE GREATER MANIPULATION AROUND THE NERVES TO VISUALIZE THE NERVES. However, it is quickly becoming the procedure of choice for the far lateral disc herniation (disc protrusions outside the boney spine compressing the nerve after it exits the spine). It is presently limited to near normal discs with no evidence of spinal stenosis or spinal instability. Traditional spinal fusion techniques are varied and require fairly destructive approaches to normal tissue, and generally are augmented with spinal instrumentation. Therefore, there is an even greater push to define easier, less destructive and more direct methods to perform spine fusions. Using the percutaneous ideas, even larger cannulas or channels that would allow bone pieces to be placed into the disc space after discectomy were tried. The early results yielded a high failure rate of bone fusion. Some surgeons have added percutaneous placement of spinal instrumentation to enhance bone fusion with this percutaneous technique. However, the early results are mixed with both very poor and very good results. Following the lead of other surgical specialities, spine surgeons have turned to video-assisted spine arthrodesis (VASA) or spine fusion. Video-assisted spine surgery allows the placement of structural grafts, similar to those used now for spine fusions, safely and with minimal normal tissue disruption. In fact, initially these procedures were to be called “minimally invasive procedures,” but very quickly this name imparted the sense that “less surgery was performed.” The actual surgical procedure is no different at the spine level than with the standard open procedures. Therefore, this name was discarded. Video-assisted spine arthrodesis is performed in the thoracic cavity (chest cavity) using a thorascopic video-assisted surgical technique (VATS), and in the peritoneal and retroperitoneal cavities (abdominal cavity) using a laparoscopic video-assisted surgical technique (VALS). These procedures are performed through multiple small incisions allowing equal access to the spine and the use of modified common instrumentation. It minimizes blood loss, minimizes postoperative pain and recovery, and shortens hospitalization to 3 days. AGAIN, LIKE THE PERCUTANEOUS ARTHROSCOPIC (ENDOSCOPIC) DISCECTOMY, VIDEO-ASSISTED SPINAL PROCEDURES ARE NEW AND HAVE NOT PASSED THE TEST OF TIME. THE COMPLICATION RATE IS UNKNOWN. SINCE ANTERIOR INTERBODY ARTHRODESES (ANTERIOR BONE FUSIONS) HAVE BEEN REPORTED TO BE MORE SUCCESSFUL THAN POSTERIOR ARTHRODESES, THE SUCCESS RATE IS EXPECTED TO BE AS GOOD AS FRO OPEN PROCEDURES PRESENTLY USED. HOWEVER QUICK THE RECOVERY, THE BONE STILL NEEDS TO HEAL. BONE FUSIONS DO NOT REACH MAXIMUM STRENGTH FOR 6 MONTHS AFTER SURGERY. For the first time, the spine surgeon has the luxury of assessing the pathologic processes of the spine and dealing with them directly with minimal normal tissue disruption. The surgical access will no longer be the limiting factor. Our understanding and utilization of the natural history of spine disease will be realized with hopefully better and consistent surgical results. Potentially, a revolution is around the corner, especially for the treatment of lumbar disc disease.